Register now to try out for the 2019 Powerade State Games............Need a game? Check out our new listing in the "Events" area.............Join now so you can nominate you players for 2019 post-season awards. …Notice to members: Your membership must be up to date no later than April 1, 2019 to be able to nominate players for post season awards for this season. Learn more about the NCHSAA playoffs seeding process. With our 2019 season winding down, the time to nominate your players for North Carolina All-District/All-State is rapidly approaching. This year’s nominations will be submitted online through a form that will be made available in the Members’ Area of this website on Friday, April 26. For a preview of the information you will need to submit, log in and select the “All-District/State” button. The deadline for submitting your nominations is Tuesday, May 7. Your player’s complete end of season stats (after your last regular season game) should be submitted. Do not include any post season play. Registration for tryouts for this year’s Powerade State Games high school softball showcase is now open. The competition will take place on June 18-19 and is open to players who are a rising sophomore, junior, or senior (class of 2020, 2021, or 2022) and are playing at the varsity level during the current 2019 season at a North Carolina high school. This annual event, which each year is attended by college coaches, is made possible by a partnership between North Carolina Amateur Sports and the NCSCA, who provides the coaching staff and event support. More information may found at ncsports.org. Click here for the tryout schedule. NCHSAA no longer requires umpires to check players’ equipment prior to each game. This, in effect, puts more responsibility on you as coach to make sure your players’ equipment is both legal and game ready. Catcher’s gear with failing straps, cracked helmets, broken face masks, cracked and out-of-round bats, and illegal bats, are all your responsibility to check for and not allow to be used in a contest. “Not knowing” is not an excuse and can cause unnecessary game delays, embarrassment to your players, and can even be detrimental to your players’ performance. Imagine your star hitter’s favorite bat being tossed at a critical time in an important game. That can be a sure way to turn the hitting switch off! Check your equipment now, before playoff time, and correct any problems. Make sure none of your bats are illegal! The list of illegal bats can be found here. The 2019 scholarship application is now available for downloading. The association is pleased to announce that our scholarship amount has been increased to $800. We will award scholarships to four North Carolina high school softball players who are entering college in the 2019-2020 school year, two in the east and two in the west. NCSCA has now awarded scholarships to 50 freshmen entering college since the program’s beginning in 2007. Full details and instructions may be found on the “Scholarships” page in the “Awards” area. The deadline for submitting the application is April 30. We are pleased to announce the folks at Softball Excellence continue to support you as a member of the NCSCA. This organization, founded by Cindy Bristow, offers valuable resources for softball coaches at all levels nationwide. If you are a NCSCA member, you have received an email from Softball Excellence explaining their discount offer. If you are not a member, we encourage you to join us and become eligible for their discount. If you choose not to join NCSCA, we still encourage you to check them out. You may visit their website and sign up for their free email newsletter. This newsletter is always full of helpful tips. Members: log in to the Members’ Area to obtain your 2019 discount. Mike Hasson, the state commissioner for NC American Legion’s fastpitch softball program will be holding meetings for the purpose of expanding the program throughout North Carolina. The program began on a limited basis with eleven teams in western NC locations in 2017, then grew into the central NC region in 2018. Teams are currently located in twenty counties of the state. Because of the positive response the new leagues have enjoyed, American Legion has committed to further expansion to include the entire state with both senior and junior programs. A key to its success is the organizers’ desire to avoid scheduling conflicts with Travel Ball, Recreation Leagues, and high school playoffs. Legion scheduling does not interfere with Travel Ball and therefore does not force athletes to choose one over the other. In fact, many participants are successfully enjoying their summer Legion experience with no effect on their participation in Travel Ball. North Carolina is the first state to establish a Legion softball program. It is very likely that other states will soon begin their own programs. December 3-5, 2018- Embassy Suites Hotel, Wilmington, NC (NC Recreation Athletic Directors Conference) Anyone interested in Legion Ball may attend. Our 12th annual fall coaches clinic, held on Saturday, November 17 at North Davidson High School, was another very informative get-together. Coaches from as far away as Wilmington traveled to Davidson County to learn from Chief Billy Gerald and Chelsea Leonard Martin, two of North Carolina’s most respected individuals involved in the world of softball pitching instruction. Also leading a very informative session on teaching the art of slapping was Mike Stover, North Davidson’s hitting coach. The association would like to thank the administration of North Davidson High School and head coach Kevin Berkley and staff, for hosting this event. Next year’s fall clinic will be hosted somewhere in eastern North Carolina at a site to be announced. This year’s clinic was supported in part by the North Carolina Amateur Sports Endowment. Special thanks are extended to the fine folks at NCAS for all the work they do in promoting youth athletics in our state. Please promote the 2019 North Carolina State Games with your players. North Carolina High Schools… Need a Softball Game? If you need to add games to your softball schedule, check out our new listing. To add your team to the list, send your open dates and contact information to webmaster@ncfastpitch.org . Congratulations are in order for the winners of our 2018 scholarships. Each year, NCSCA awards scholarships to four graduating seniors who have demonstrated consistent hard work and dedication both to their high school softball teams and as students in their schools. While not necessarily performing always in the limelight, these young ladies are the kind of student-athletes that bring with them a certain quality that no team can function successfully without and that every coach is proud to have as part of their team. NCSCA is pleased to announce the recipients of our 2018 All-District and All-State Awards. 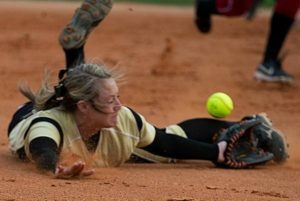 The skill these players have demonstrated during the 2018 high school season illustrate the level to which softball has risen within each of the eight districts of North Carolina. The listing may be found in the AWARDS area. Please note: Certificates will be issued to the players’ coaches for distribution to recipients by the end of July. Names will be printed in early July on the certificates exactly as they appear in our posted listing. Please notify webmaster@ncfastpitch.org of misspelling as soon as possible. Advertise your Scrimmages, Tournaments, Camps and Clinics. Send the information you want posted to webmaster@ncfastpitch.org and we will place it in our “Events” area.